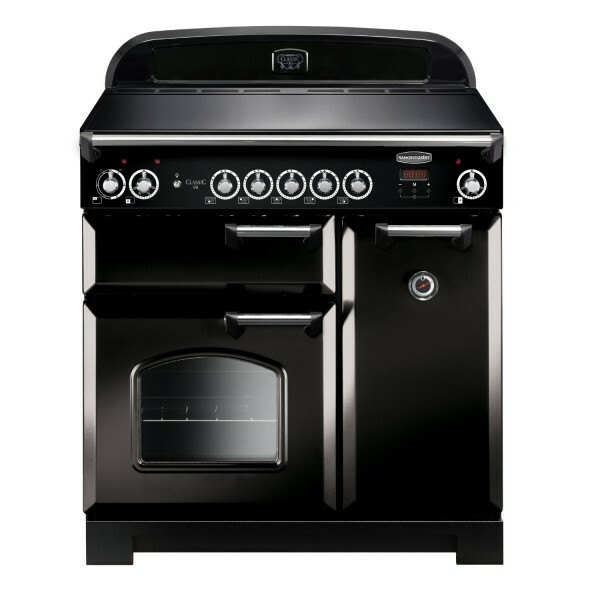 Product information "Rangemaster - 90cm Classic Induction Range Cooker"
When you want the classic range cooker look, our Classic model is the perfect choice and comes in three sizes – 110cm, 100cm and 90cm. Style-wise it offers everything a traditional range cooker should – bevelled doors, arched windows, handy towel rail and a choice of three classic colours – Cranberry, Gloss Black or Cream all with a chrome trim. All models, whichever fuel you choose, come with a Handyrack, which is similar to our Handygrill and attaches to the main oven door so you can pull the roasting tray out with ease and safety. You’ll also benefit from a storage drawer for baking trays (110cm) and programmable oven, which gives you the freedom to start and finish cooking a dish while you are out – the best welcome home you could wish for. It’s also A rated for energy efficiency. There’s a choice of gas, dual fuel and electric (ceramic and induction) with gas ovens, grills and hobs, tall electric fan ovens, conventional oven and dual circuit glide-out grill, as well as multi-ring burners, warming zone and griddle. Whichever model you choose, you’ll benefit from Rangemaster’s exceptional build quality and attention to detail. Each cooker has a Tri-tonne™ frame, Multi-glaze™ oven door, EasyCook™ controls, Cookmax XL™ ovens, Spill-guard™ hotplates and Endurance™ finish, all checked and tested prior to delivery. Related links to "Rangemaster - 90cm Classic Induction Range Cooker"
Customer review for "Rangemaster - 90cm Classic Induction Range Cooker"